Royal love is in the air at Le Dolci in Toronto's west end, where the head baker is whipping up delectable palm-sized recreations of Prince Harry and Meghan Markle's lemon elderflower wedding cake so Canadians can taste the distinct aromatic tang from across the pond. She injects a dollop of lemon curd into each cupcake, then pipes a rosette of yellow buttercream icing infused with elderflower syrup on top, shaving a smidge of citrusy zest as the finishing touch. The sun-filled bakery has become an assembly line of royal-inspired goodies, with a smattering of tiaras sitting on the table to get workers in a festive mood. A cake decorator slices away at blue, red and white fondant to mold cupcake toppers shaped like the Union Jack and the American flag in honour of Harry and California-raised Markle. 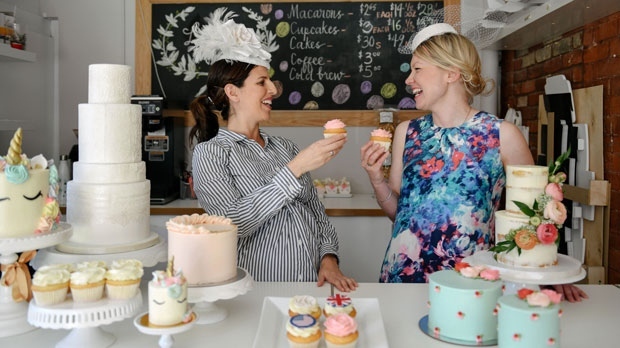 Owner Lisa Sanguedolce and general manager Danielle Ellis are decked out in ornate white fascinators, which they said were fashioned by a royal-trained milliner in Toronto, as they sit off to the side for a spot of tea, clinking their cups before indulging in the British pastime. Despite Le Dolci's Italian name, both Sanguedolce and Ellis profess tangential ties to the British royal family. Sanguedolce showed off a photograph she said was clandestinely taken during a private luncheon with Queen Elizabeth held for her husband's army regiment in 2003, describing the royal spread as a scene out of the British TV show "Downton Abbey." Ellis, a native Brit, said she grew up near Diana's family home, and as a child, presented Princess Anne with flowers when she visited her tiny village school. She was in London to celebrate the nuptials of Prince William and the Duchess of Cambridge in 2011, and said she is hoping to recapture some of that convivial excitement with Le Dolci's specialty menu, which rolled out earlier this month, leading up to the May 19 nuptials. "Between the two of us, we've got quite a few connections back to England and London, and I think the royal wedding is just a great opportunity to get loads of different people involved," Ellis said. "I think whether you admit to it or not, everyone's going to be interested in watching (the wedding), so let's all get together and have a great morning." "We're going to bring out all our favourite sweet treats for the marriage and celebrate along with them, even though we're an ocean away." Jesse Lauzon of Springridge Farm in Milton, Ont., said the fruit growers have cooked up a limited edition Royal Wedding Jam to mark the union of Harry and Markle, which can be purchased at the farm alongside a life-size cardboard cut-out of the couple. "If you had told me when I was in chef school learning how to make food that one day I would be on the computer Googling 'royal wedding cut-out,' then I'm not sure I would have believed you," said Lauzon. 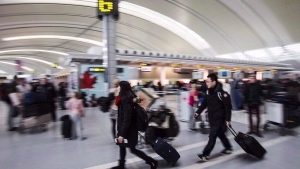 "We just got swept up in the excitement like a lot of other Canadians." The jam is made of strawberries and Canadian sparkling wine, Lauzon said. "It's berry for Harry, and sparkle for Markle." Retailing for $6.99, nearly 2,000 jars had been sold as of early May, he said. The jam is the latest addition to the farm's line of royal-inspired preserves, having made marmalade for William and Kate's wedding, Royal Baby Jam for the birth of Prince George, and another jam for the Queen's Diamond Jubilee. Lauzon said the farm even got a thank you note from the Queen last year after sending her a jar of its Canada 150 Jam -- a blend of strawberries from Ontario, raspberries from the West Coast and blueberries from the East Coast. "I think jam, especially strawberry jam, is quintessentially English, but I think it's also kind of quintessentially Canadian," he said. "We're sort of in the celebration business to begin with, so this kind of feels like a natural fit for us. "Who doesn't love a royal wedding?"